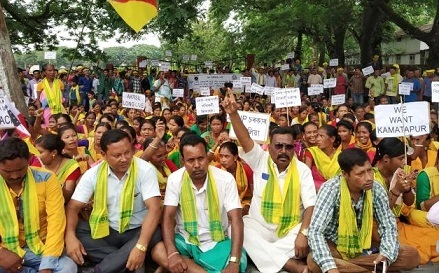 Reiterating their demand for creation of a separate Kamatapur State and categorisation of the Koch-Rajbongshi community as Scheduled Tribe (ST), the Udalguri District Committee of the All Koch-Rajbongshi Students’ Union (AKRSU) along with the All Koch-Rajbongshi Sanmilani (AKRS) staged a sit-in protest at the premises of the Deputy Commissioners’ office here in Udalguri on Monday. The Koch-Rajbongshi organizations staged the protest for three hours starting from 11 pm. 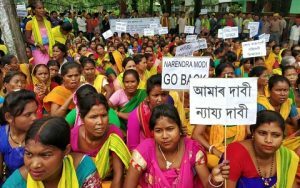 The protestors comprising both men and women alike came down heavily on the alleged statement made by Union Tribal Affairs Minister Jual Oram that “it takes four decades to grant ST status to a community and hence there’s little hope for fulfilling the demands for ST status by the six communities of Assam. The activists holding placards raised high pitched slogans like ‘No ST no rest’, ‘BJP go back’ which rented the air. The president of the Udalguri unit of the AKRSU, Atul Barman, alleged that the Central Government has been turning deaf ears to the genuine demands of the community for years after years. He also criticised the ruling Bharatiya Janata Party (BJP), which had made false promises to fulfil their demands within six months after coming to power. The students’ leader also alleged that the indigenous Koch-Rajbongshi people have been ‘harassed’ in various places of the State in the name of verification of documents for inclusion of names in the National Register of Citizens(NRC). The president of the All Koch-Rajbongshi Sanmilani (AKRS), Sunil Kumar Barman, also came down heavily on the saffron party and Prime Minister Narendra Modi for false pre-poll promises. The two Koch-Rajbongshi organizations also submitted separate memorandums addressed to Prime Minister Narendra Modi and Assam Chief Minister Sarbananda Sonowal through the office of Deputy Commisioner, Udalguri.